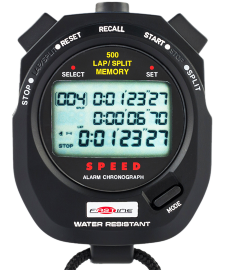 Stopwatch with a unique data recall mode which enables you to store batches of split times as segments in memory. So that if you were timing a series of races. The lap times for each race can be stored in memory as one segment. The time of day that the race or event was started is also stored. Measures up to 19hrs 59mins 59 secs 99/100ths sec. Triple display shows: Lap counter, Cumulative and Lap split time to the last split. Cumulative and running times. 500 cumulative and split times can be stored in memory with fastest, slowest and times identified. Time out (start, stop, resume) function is also included. Top cumulative and middle Lap Displays returns to running time after 5 seconds. Bottom cumulative display runs continuously. The number of free (unused) memories is shown first. Press start to scroll through all the segments. The current segment will be shown first. The date and time stamp when the segment was started The segment number and the number of laps stored in the segment. Maximum setting 19hr 59min 59sec Display shows TARGET TIME, and COUNTING DOWN TIME. Alarm sounds at the end of each countdown/up. When set to countdown/up option, the timer counts down from the preset target time to zero, then counts up in 1/100th second until stopped. Other options are to select a repeating countdown. Or programme the timer to countdown to zero and then stop. Option to START, STOP and RESTART the countdown/up are available. The pacer value can be adjusted from 05 to 240 PACES per minute. The display shows the TARGET COUNT PER MINUTE. Use this function to set and measure a required number of actions per minute. Pressing the split button increases the target count per minute. Enter a distance over which time is to be measured, for example a racing circuit of 1 mile (or km). 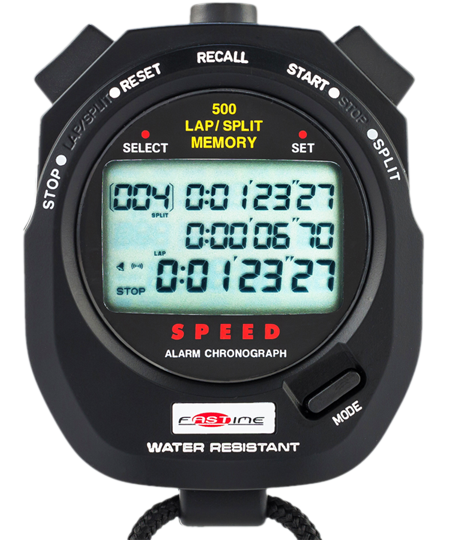 The stopwatch will then show the lap time and speed for each lap. Speed is measured in units per hour. Therefore speed = distance x 60. Measures a sample of 3 strokes or actions and returns a frequency or rate per minute. Press the start button to begin measuring the stroke rate. Display counts down from 180.Press again after 3 strokes and the display shows the rate per minute. Ideal for Swimming or Rowing. Hour, minute, seconds time of day with 12/24 hour option. Year Month Day Date.